I saw Status Quo in Exmouth last Sunday. Or at least they purported to be Status Quo. They didn't fool me, however, because they looked nothing like them and even the name wasn't quite the same. They called themselves Quo-incidence, and they were playing at the Exmouth Cider Festival. There are some things in life that go hand-in-hand, isn't there? Fish and chips, Morcambe and Wise, er... night and day, um... love and hate, ... er... Status Quo and cider! They were onto a winner straight away, really, playing this gig. Alas, as it was only 4 o'clock in the afternoon and not being a northern industrial imbiber, I was stone-cold sober, which meant rather than being 'really good' Status Quo were instead merely 'good'. Looking at the rest of the audience, they seemed to be treating the concert as a rather sedate affair with very little nodding of heads let alone full-on head-banging. On closer inspection I realized it was because they were all too wrecked to even move. On the outside they may have looked like strangely beautiful Easter Island statues but on the inside they were in the delirium of a cider-fuelled frenzy. You could see it in their eyes. They were in rapture and Status Quo were the heavenly choir. It begged the question, actually: How come Status Quo aren't as revered as say, the Ramones? Both bands led long and distinguished careers, both being globally (and fabulously) famous. Both produced seminal and unquestionably classic songs and albums and both went equally astray over the years, producing some pretty ropey rubbish. Both stuck to an almost rigid formula and both laid down a gauntlet of examples to follow and to most definitely avoid. So how come Status Quo lack the same critical respect as bestowed upon the Ramones? How come wearing a Status Quo t-shirt is decidedly uncool whilst wearing a Ramones t-shirt is moderately hip, even when purchased in Primark? Such are the mysteries of the Universe. For all that, I would have preferred a Ramones tribute band over a Status Quo one but such is life and you can't always get what you want though sometimes you might find - as someone once sang - you get what you need. Do the Ramones go hand-in-hand with cider? Is a Status Quo tribute band what we need? Are there even any Ramones tribute bands around nowadays? 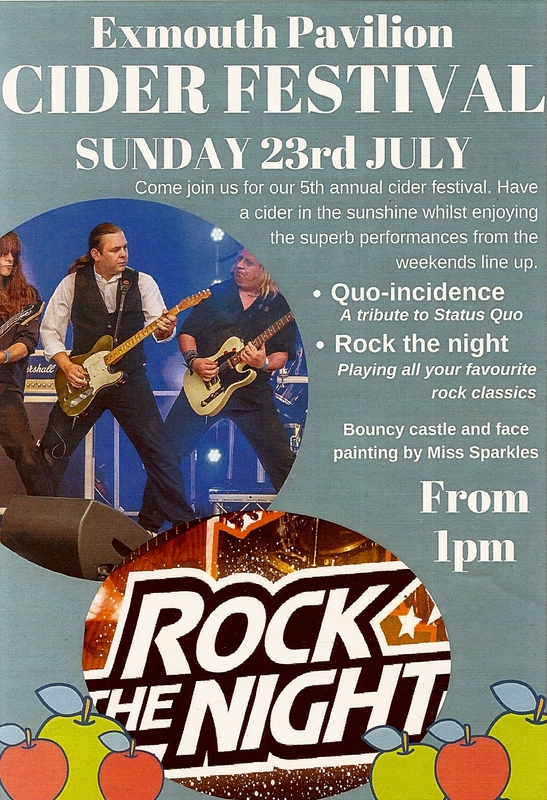 And by the way, if anyone thinks Bristol and Somerset are good for cider then I should let you know that there are people down here in Devon whose whole lives are one big, never-ending cider festival with the soundtrack to their lives being Status Quo's Paper Plane. And there's nothing wrong with that in the slightest, I might add.